At our unit and, we posit, many around the world, we are faced with preservation over function. This was the spark for the manuscript, below. We hope it is helpful as a guide. Just as with any guide, though, personalizing care and what we call “sociomechanics” (or preservation coupled with current job or activity demands) is key. We’d argue that this really is the “sole” of precision care. Both single and multiple toe amputations biomechanically alter foot function to varying degrees. In patients with diabetic neuropathy, these changes often lead to increases in deformity, plantar pressure and risk for ulceration, infection and reamputation. While a philosophy that strives to maximize limb length and function by performing the fewest and most distal amputations possible is likely a good one, we believe that a basic “formula” might help serve as a guide for surgeons to balance limb function with tissue preservation. Digital amputations that exceed a “hallux plus one lesser toe” or “lesser toe plus two” digital/ray amputations in our experience often surpass a threshold of mechanical function. For any clinical scenario in which amputation would extend beyond this threshold, a transmetatarsal amputation (TMA) or pan metatarsal head resection (PMHR) should strongly be considered to avoid costly foot complications and the need for excessive revisional surgery. 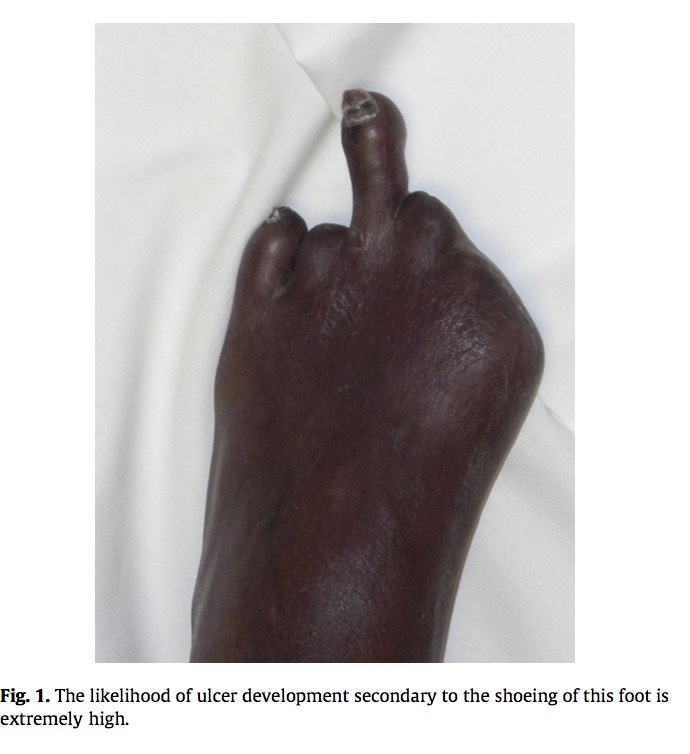 Such an approach still maintains an underlying philosophy of functional limb preservation. We are unaware of any other attempt to standardize the advancement of surgical intervention from multiple toe resections to a full metatarsal level or higher resection. Therefore, we present this simple formula for surgical planning in the hopes of providing the most durable and efficient care of the high-risk diabetic foot when multiple toe amputations are needed. I agree with this concept. Because in the pursuit of less amputation we leave the patient sometimes with unviable future deformity risk because of significant pressure dynamic changes as highlighted by some of the photos here. Dr. Rastogi: Thanks a million for this. We agree entirely. The goal, I think, is to find balance between function, lifestyle and, perhaps most importantly, a person’s (and his/her family’s) own wishes. I must say that we work toward (and struggle with) this balance every day. This particular topic is paramount to the longevity of the patient and the financial systems caring for them. I am happy to see some attention being directed to a more algorithmic approach to the preservation of a functional foot with or without toes. It all starts with the Hallux then the 2nd and the 3rd and so on. If we could get a consensus to the need to determine at what point do we take all the toes and what clinical scenarios require what type of amputation then we can begin to perform the correct surgery once and hopefully avoid repetitive trips to the ER and the OR and thus save the patients time and Save everyone money. Not being on the front line of limb salvage like you guys I am guessing that often people don’t feel as much of a “failure” if they still have toes /a toe remaining..They probably have the mindset that if a future problem develops they can deal with it then and don’t fully take on board the increased risk the deformity poses to ulceration and infection.. This has really enlightened me as to the bigger picture and certainly as one on the coal face of prevention by raising awareness I couldn’t agree more with you on the need for a diabetic patient facing amputation to understand that sometimes more means less in so much as remove more toes and have less likelihood of future ulceration and infection which could spiral out of control leading to much more serious complications . Thank you as always for the valuable content DFBlog provides .